p>Houdini is the unquestionable number one! The program, written by the Belgian Robert Houdart, is known for finding tricks and resources in positions that just can�t be cracked by other engines. Now, with the release of its latest incarnation, Houdini 4, the engine has been improved significantly across the board. Its 50 Elo point boost in playing strength represents practically double the performance in analysis and engine matches. 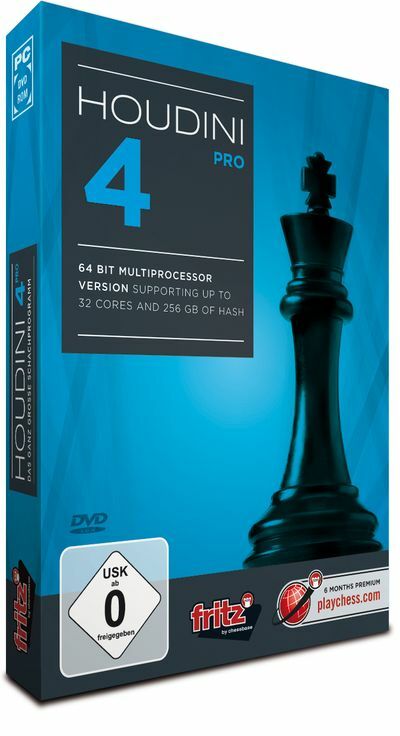 Minimum: Pentium III 1 GHz, 2 GB RAM, Windows Vista, XP (Service Pack 3), 7/8, DirectX9, 256 MB graphics card, DVD-ROM drive, Windows Media Player 9 and Internet access for program activation, access to Playchess.com, Let�s Check and program updates. Recommended: PC Intel i5 (Quadcore), 4 GB RAM, Windows 8.1, DirectX10, 512 MB graphics card, 100% DirectX10-compatible sound card, Windows Media Player 11, DVD-ROM drive and Internet access for program activation, access to Playchess.com, Let\'s Check and program updates.